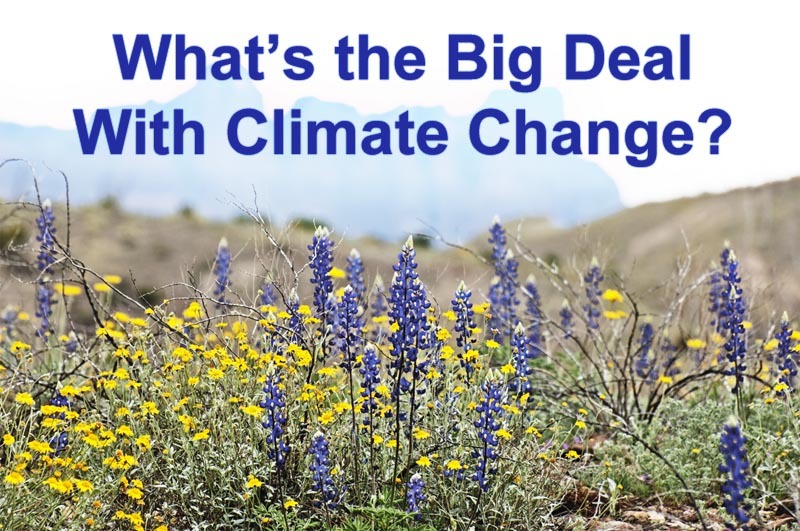 What’s the Big Deal With Climate Change? Big Bend National Park, March 2015, River Road near Soliz. Climate change has come to the heart of the Chihuahuan Desert. The dead sticks in the photo are creosote bush kill from 2011 drought and possibly continuing stress due to drought root damage. This two-foot tall cresosote bush forest in the desert is impacted just like any other forest. Climate Change has warmed beyond the evolutionary adaptation of species with mass die-offs being the result. What will happen when all of the canaries are dead? We all understand climate change is trouble. Even a really significant percentage of oil and gas professionals understand. Of a recent poll (2014) of 474 oil and gas industry insiders, 85 percent believed global warming was happening, 58 percent were either very sure or extremely sure, and 57 percent understood that the warming was caused by man. So why aren’t we doing something meaningful? Even though we all know climate change is trouble, what we don’t know is when and why it is trouble. This is the root of why we have yet to act. As the opinion work shows above, it’s not really the so called “deniers” that are the roadblock to climate change action. If oil and gas industry professionals, and even Texans in this great red state; if those folks all believe similarly to the rest of the U.S. population — they are listening. Really then, the challenge is communications to all of us. The O&G subset, the deep red subset; they really are listening. The message is two part: Part one — What’s happening now is tremendously bad. The “tree” kill in the Big Bend for example: Ocotillo forests, creosote forests, not to mention real trees at altitude, all these desert ecosystems are suffering just like other ecosystems across the world. They are nearing or beyond epidemic levels of drought, and insect and disease attack. What happens to the rest of us when all the canaries are dead? Ninety-six million acres of conifers across Western North America are 60 to 90 percent killed by native beetles and disease. That’s over 20 percent of all western North American forested lands. Impacts like this are everywhere, we just don’t see them because they are obscured by distance, elevation, remoteness. And maybe most importantly, they are obscured by a low comprehension of what “dangerous climate change” really is. The second part of the conundrum is that these ongoing things pale in comparison to impacts in the future. The biggest challenge with climate change action is that impacts lag emissions by 30 years or more. This means impacts today are driven by an equilibrium concentration of CO2 in the atmosphere from the 1980s. Our oceans and ice sheets are so influential in masking warming through planetary air conditioning that it will take another 30 years for impacts to grow to be in equilibrium with CO2 concentrations today. And this challenge is doubly important because of two things: 1) We have emitted as much CO2 since the 1980s as we emitted in the previous 250 years, and 2) impacts increase nonlinearly with warming. So a little warming does not result in a small amount of additional extremes, it results in a lot more extremes. Hurricane Harvey was an example. Widespread reporting identified Harvey as a 1,000 year storm. This means that we can expect Harvey to recur on average once every 1,000 years in our old climate. But projections are for storms this extreme to become much more common. Unfortunately, all of that reporting was a popular press echo chamber nightmare of misinterpretation of work out of the University of Wisconsin. This work identified the frequency of recurrence for a single 24-hour period of rainfall during Harvey of about 13 inches. It was such an astonishing-sounding proclamation that it went viral in the media. But it was only an evaluation of a single day out of the big five-day stall that Harvey executed along the Texas Coast. Three of those days were each individual 1,000-year events. Three days in a row. The odds of that happening are far more rare than that of a 1,000-year storm alone. When the advanced calculations were performed, Harvey was not a 1,000-year storm, but a 25,000-year storm. And this is what’s happening today. Extremes are increasing nonlinearly based on just the CO2 in the sky now, with zero additional emissions. The challenge then is communications. If we could overcome the story from moneyed interests that the jury is still out, folks would understand. How do we overcome this story? The way the new global warming psychologists are telling us that this can happen is through talk. If we talk about it more, if it becomes more familiar to us; we begin to be able to better use deep thought to understand for ourselves–to see these impacts for what they truly are, and not trust those who would have us believe otherwise. Hurricane Harvey, 25,000-year Storm: Enhanced, or Caused by Climate Change?